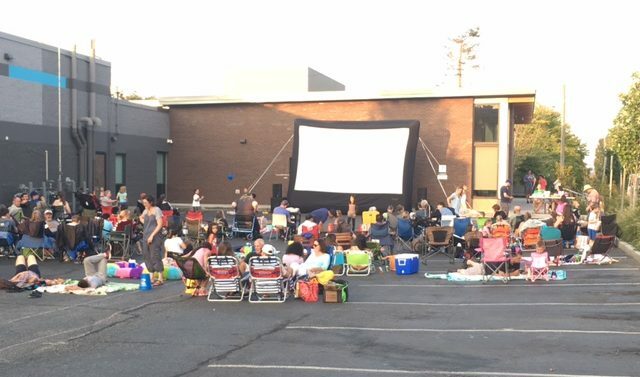 Usually about this time on midsummer Saturday nights, a happy crowd is well into watching the week’s free presentation at West Seattle Outdoor Movies. But you won’t see that scene – or be part of it – this year, unless a new organization is found to take over the series for what would be its 15th season. The movies long had a home at the courtyard adjacent to Hotwire Online Coffeehouse. But a few factors ended that, including proprietor Lora Radford selling the shop (she’s now executive director at the West Seattle Junction Association, and still a big booster of/adviser for the movie series), and the crowds simply outgrowing the space. The series moved to the “festival street” outside the West Seattle YMCA (WSB sponsor) at the end of the 2016 season, then shifting to its west parking lot, but that hasn’t proven to be the right fit for either the Y or WSOM, and so a new presenting organization is being sought – providing the site, equipment, among other things. Ideas? Interest? Contact Lora Radford for starters, lora@wsjunction.org. 9:14 PM: Saturday night callout for one of SDOT’s Incident Response Team: They’re cleaning up after a crash at Harbor/Avalon/Spokane. This may block north-to-eastbound access to the bridge onramp (and lower Spokane) from Avalon for a while longer, so if you have to head out, consider another way. No serious injuries reported – SFD has cleared the scene and no medic unit was dispatched. 10:10 PM: Scene’s not clear yet, but the SDOT live cam shows traffic is now getting through onto eastbound lower Spokane and the bridge onramp. 10:19 PM: Clear now, reports SDOT. SR3 UPDATE: SR3‘s Casey Mclean brought the ACC up to speed on her plans for a fulltime space off Harbor Avenue SW, not just for marine-wildlife rehab, but also for research. She said the space is on the Merlino industrial property east/south of Salty’s on Alki (WSB sponsor), with permits in progress but no firm timeline so far. Nothing will go in until the permits are in hand, but she has two tanks on order and plans to add a modular building. HALA MANDATORY HOUSING AFFORDABILITY: As noted here earlier this week, the upzoning proposal is now up for council consideration of amendments. HALA MHA would upzone multifamily and commercial property around the city, so Alki would be affected though it’s not an “urban village.” One amendment is specifically within the ACC’s area of interest, asking that the commercial node near Beach Drive/Carroll not be upzoned. The Alki Community Council meets third Thursdays, 7 pm at Alki UCC (6115 SW Hinds). KING TIDES: Without stormier weather, we’re not likely to see a scene like that, but you still might want to know that the highest high tides of winter 2019 are just a few days away. Wednesday (7:01 am) and Thursday (7:43 am) will both bring 13.1-foot “king tides,” a bit lower than last January, which had two days with 13.2 tides. Here’s the full tide chart. ECLIPSE: The forecast does not look favorable for seeing the Super Blood Moon lunar eclipse Sunday night. But if we get a break – here are the times to look. An informational meeting on how you can help make the Loop the Lupe Obstacle Course and 5K Fun Run in 2019 a smashing success is happening Wednesday, January 23rd, 7 p.m., at the Pastoral Center at Our Lady of Guadalupe Church. School groups, families looking for volunteer hours, WE WANT YOU!! Help us take this event over the top- -it’s happening June 8 at Walt Hundley Playfield! RSVP to loopthelupe@gmail.com. Thanks, and GET IN THE LOOP! The OLG Pastoral Center is on the NE corner of 35th SW/SW Myrtle. P.S. Not all riders crossed the low bridge, of course – the Water Taxi has some bicycle capacity (plus added parking at Seacrest) as do Metro buses. SEE THE FULL LIST … on our complete calendar!